Melasma, also known as chloasma or “mask of pregnancy,” is a benign, but incredibly frustrating and annoying tendency to develop areas of brown blotchy skin, usually on the face. It comes from melanocytes (the pigment producing cells in our body) making too much pigment. It affects women much more often than men, is more common in people who tan easily or have darker skin types, and usually develops between the ages of 20 and 40. Sun exposure is probably the single most important factor in melasma. In many patients, melasma would disappear if you could avoid the sun completely. Another way to think about it is that melasma comes from having some parts of your skin that tan really, REALLY well compared to the surrounding areas. A tiny bit of sun exposure will bring it out. Pregnancy is one of the classic associations. In many women, the blotches from melasma will fade a few months later. Hormones are a big factor. Oral contraceptive pills, hormone replacement therapy, and even IUD’s can bring out melasma. 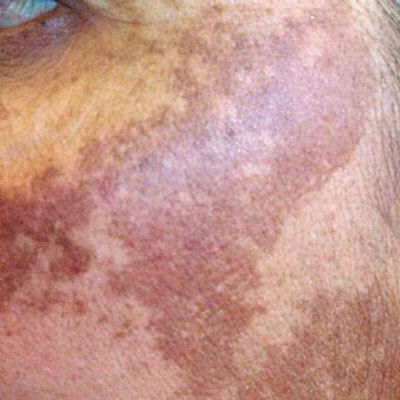 The genetic cause of melasma is complex. There is a genetic predisposition to melasma, with at least one-third of patients reporting other family members to be affected. 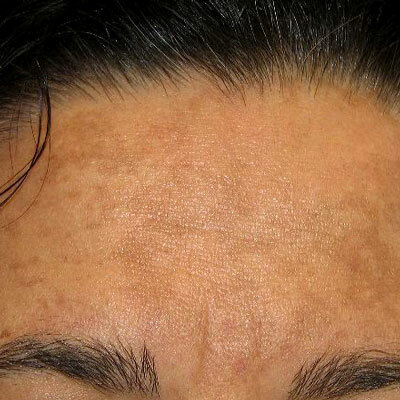 In most people, melasma is a chronic disorder. Use aggressive year round sun protection. Stop any form of hormonal supplementation if possible. Explore cosmetic coverups to camouflage it. Hydroquinone 8% as cream or lotion used daily for several months. 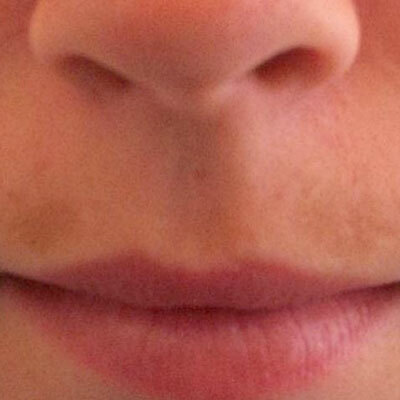 This needs to be applied, often using a q-tip as a paintbrush, specifically to the dark areas. It can be irritating to the skin. When used for long periods of time without interruption, it can lead to a peculiar condition called ochronosis which is a paradoxical darkening of other areas of the skin. Azelaic acid is a naturally occurring substance that is very safe, even during pregnancy, and useful for many women. Topical steroids help fade the color and can help with the irritation caused by other products. Topical retinoids (retin-a, tretinoin) also lead to lightening of the skin, but tend to be quite irritating. The most effective topical treatment is a mixture of hydroquinone, tretinoin, and a topical steroid which can be obtained by mixing the separate products together, which we offer here at our office. Other options include superficial chemical peels to remove the excess pigment in the top layers of skin. There are some over-the-counter products that include soybean extract, Kojic acid, and ascorbic acid (Vitamin C) that can be slightly helpful as well.